Each 12-hr period thereafter - $18. Payment Methods: Cash (U.S. currency), check (in U.S. currency), American Express, MasterCard, Visa, Diners Club, Carte Blance and Discover cards are accepted for payment of parking fees. E-Z Pass - is a faster way to pay for your airport parking and is accepted in all lots. 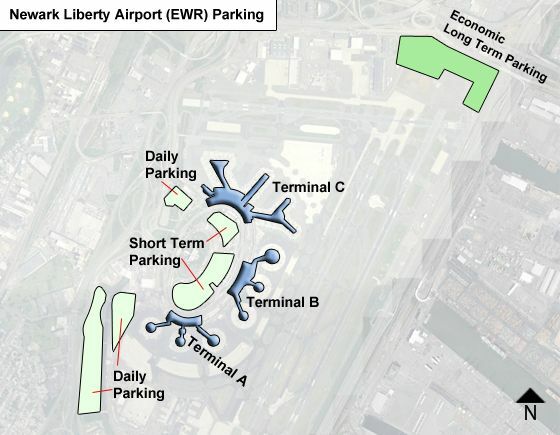 All customers who plan to park at Newark Liberty International Airport for more than 30 days should contact Five Star Parking the day you arrive at 973-961-6421 or 973-961-6422. Please provide them with your name, license plate number and the estimated number of days you plan to park at Newark. Any vehicle parked over 30 days will be towed and the owner will be subject to retrieval costs. Phone Numbers to use: Parking - 1-888-397-4636, then press 22 to receive up-to-date information. Off Airport Parking: In addition to the on-airport parking, there are a number of privately operated parking lots located near the airport. where is the cell phone lot located? Do you need to reserve a space in advance at Parking Lot C?